The second leading cause of death for people under the age of 44 years is suicide. Overall, it is the the tenth leading cause of death in the United States, with veterans comprising 22.2% of this statistic. Women are three times more likely to attempt suicide, but for every woman who takes her own life, four men will die from their attempt. Although older adults make up only 12% of the population in the States, they account for 18% of all suicides. These fatal events in the elderly are probably under-reported by 40% with “silent suicides”, dehydration, “accidents”, medication over doses, etc. ending in death. Additionally, double suicides involving spouses or partners occur most frequently in this population. Since the elderly are the fastest growing segment of the population, these later-life deaths are predicted to result in suicide becoming a major public health issue in the too-near future. C-reactive protein (CRP) is associated with high levels of inflammation found in people with inflammatory disorders, burn and trauma victims, in obese individuals, in people with infections or with cardiovascular disease. People with suicidal thoughts (known as suicidal ideation) or attempts, also exhibit high levels of C-reactive protein compared to people without such behaviors. Inflammatory factors are triggered during stress and are associated with depression. 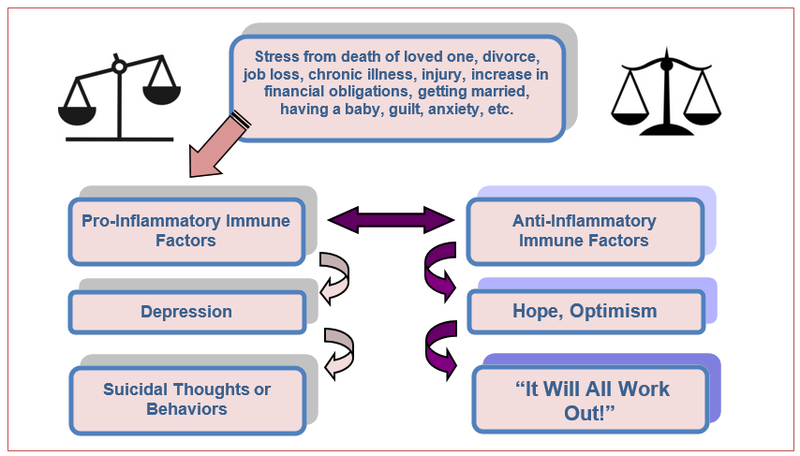 When compared to patients being treated for psychiatric disorders who are not suicidal, individuals who have contemplated or attempted suicide have increased levels of inflammatory cytokines, immune cell molecules in their blood and/or brain. The ratio of inflammatory molecules to anti-inflammatory molecules in the body either promotes inflammation or limits it. A healthy immune system constantly strives to maintain these factors in a delicate balance, in immune homeostasis. Engage in physical activity at least 30 minutes a day 5 days/week. Add one or more daily servings of a superior immune support supplement to your diet. Eat a wide variety of colorful fruits and vegetables. For decades I have helped people enhance their quality of life. I can be contacted at: DrHellen@DrHellenGreenblatt.info, use this form or give me a call at 302.265.3870 (ET USA) and let us talk. Your first 30 minutes are on me! You’ve tried everyone and everything else, let me help you feel good again, you deserve it!